Skip Back One Chapter - If you have added chapters to the video footage, this button will allow you to skip back through them. Rewind (quickly) - This button will allow you to quickly rewind through the video. Pause - This button will pause the video. ''Rewind (slowly) - This button allows you to rewind through the video footage in slow motion. Back One Frame - This button allows you to move backwards through the video, one frame at a time. Play - This button plays the video in real time. Forward One Frame - This button allows you to move forwards through the video, one frame at a time. ''Forwards (slowly) - This button allows you to move forwards through the video footage in slow motion. Fast forwards - This button allows you to move quickly forwards through the video. Skip Forwards One Chapter - If you have added chapters to the video footage, this button will allow you to skip forwards through them. Mute - This button allows you to mute the sound on the video. To un-mute it, simply re-press the button. Following keyboard shortcuts allow you to move forward or backword through the video. Unless you've got a particular reason to change De-interlace type, it's strongly recommended that you leave this option set to "Adaptive De-interlace" which improves the quality of the image with moving video. Only for video footage with very limited movement does turning off de-interlacing give an improved picture. (to read about what "interlacing", please refer to here: http://en.wikipedia.org/wiki/Interlacing). Using the "Draw Method" drop down menu, you can choose between Direct3D (DirectX 9) and DirectDraw. Direct3D is the default draw method. If you have a newer PC with windows XP installed you will not feel not any difference in play back using either DirectDraw or Direct3D. However in Windows Vista only option we recommend is using direct3D. If the PC is older, then use DirectDraw. DirectDraw may be faster in some older PCs. 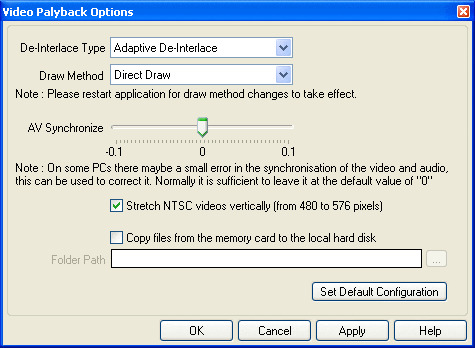 Using Direct3D in some older computers may result a jerky video playback. Note: Direct3D is one of the APIs in the DirectX9 API collection. As Direct3D is the most widely used API in the DirectX API collection, most people use DirectX and Direct3D interchangeabley. On some PCs there may be a small error in the synchronization of the audio and video and this can be used to correct the error. Normally it is sufficient to leave it at the default value of zero. when this option is enabled and folder in a local hard disk is set, if the Video Playback program detects video files are in a compact flash card,first it copies the video files to the local hard disk folder and start playback from it. This will reset all the options on this dialog to their defaults.